Do you remember as a child wanting a pony or horse? Why? Horses are very calming. Just as with any pet, when you get stressed you reach for your best friendwhether it is a dog, cat, bird or horse. 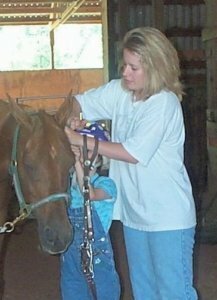 Over the years I have watched how horses interact with special children and adults.I have seen the difference in the walking, talking and even social skills that this interaction can bring.Some adults have even learned to trust again. I have been involved in the therapeutic riding program since 1989 and have met and helped so many special needs children and adults and hope to help many more in the future.Once you see the smile on a child's face and kow that you helped put it there,it is very heartwarming,and you know you have made a difference in someone's life. I would like to welcome you to come out to our stables. Besides horses , I also have chickens, geese, ducks and a pot bellied pig that are all part of the program. Therapeutic riding is the use of movement of the horse and the application of the principles involved in riding andhorsemanship to enhance the rider's quality of life. The particular goals and the techiquesused to achieve these goals will differ with each student according to their specificdisability, injury, illness or trauma. Along with the physical part of the therapy; mental,social, educational and behavioral objectives will be incorporated into the lesson plan. 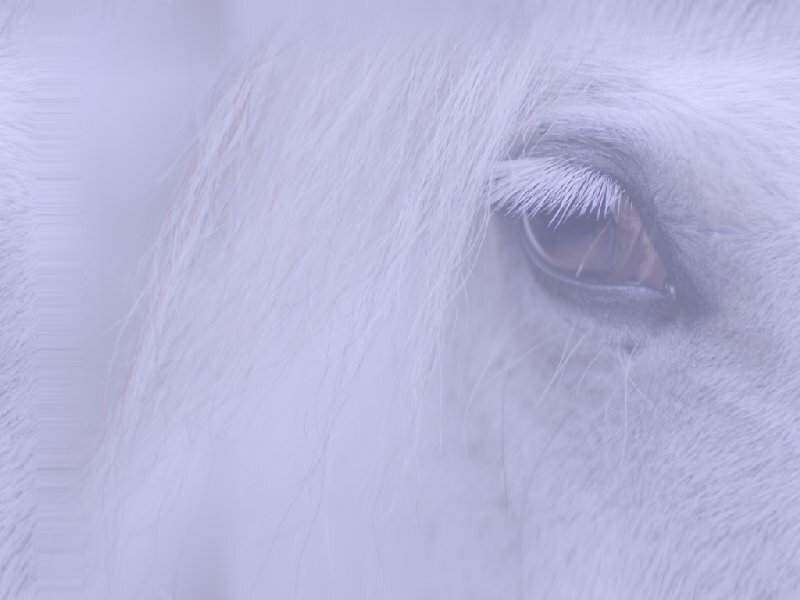 It is the three-dimensional rhytmical motion of a horse that stimulates and works the muscles of the rider.Forming a bond with a large animal can offer a tremendous sense of freedom and independemceto a disabled individualand can promote feelings of trust and self worth. Exercises or tasksthat would be considered dreary or a chore in any other setting, become fun and gamelike when they are partof a riding lesson. In fact, there are numerous case histories and increasing numbers of research articlesthat have documented disabled riders gaining the ability to walk, nonverbal students speaking their first words,emotionally disabled children gaining the ability to trust and to interact with others andchildren with learning disabilities showing marked improvement in school, all due to their participation in therapeutic riding programs. Therapeutic riding can be divided into 3 categories. Centers may offer one or more of these approaches,or an integration of all 3. Therapeutic riding is not yet covered by health insurance, so until this type of program is recognized by the health insurance community,the children and we here at Crosswinds Stablesare asking for your help. Through your donationsand sponsorships you will be helping us keep the costs affordable for the families who need our services. Donations and sponsorships will go to the children and the horses that keep the smiles on the faces of the children. Hello, my name is Brenda Elder. I have a son who was diagnosed with ADHD.Through his therapeutic riding sessions at Healing Winds, he has learned how to ride. These sessions have also given him better social skills and better control over his activities. At age 4 my mother and father bought me my first horse. I was involvedin 4-H programs for 10 yrs. After 4-H I started giving lessons to other childrenand 4-H students. In 1997, I started working with my mother (Nancy Elder) in her therapeuticriding programs. It was at that time I learned how important this type of program is to childrenand adults with special needs. Every student I have looks forward to their next session.working with these special children and adults is what has made my experience atHealing Winds so remarkable. Along with each session, the students have the opportunity to groom and help saddle the horses.While they are riding, the students are doing exercises and following small directions. After the session has been completed, they again can help brush the horse. Thestudents have the opportunity to interact with our barn members. Thank you for your time and interest. We hope you will become a part of our family soon. And yet, he could not walk unaided. The above poem was given to me by Blayne, One of our special kids. Thank you Blayne.